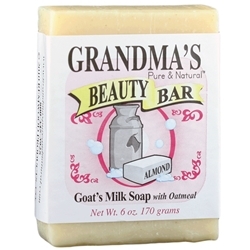 GRANDMA'S Beauty Bar with Goat's Milk, 4.0 oz. Grandmas Goat's Milk Beauty Bar 4.0 oz. Mild complexion bar with moisturizing goat's milk and soothing oatmeal blessed with Almond essential oils. Almond/Oatmeal: Lard (food grade), Water (aqua), Sodium Hydroxide (lye) with Retained Glycerin, Olive (Olea europaea) fruit oil, Hydrogenated (Cocos nucifera) coconut oil, Castor (Ricinis communis) seed oil, Goat's Milk, Avena Sativa L., Poaceae (Avena Sativa L., Poaceae (colloidal oatmeal)) & Fragrance.